For our USA weekend, we celebrated with an All American Backporch BBQ. 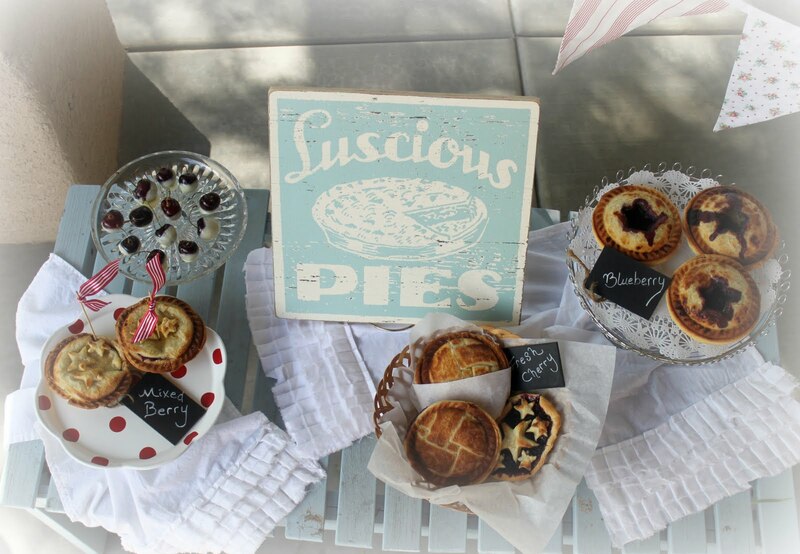 *Just for fun* I set up a table with a variety of mini berry pies...HELLO DELICIOUS. 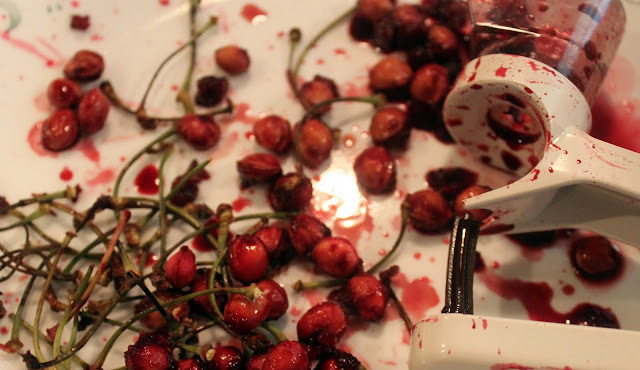 My idea started with thoughts of FRESH CHERRIES in the summertime. 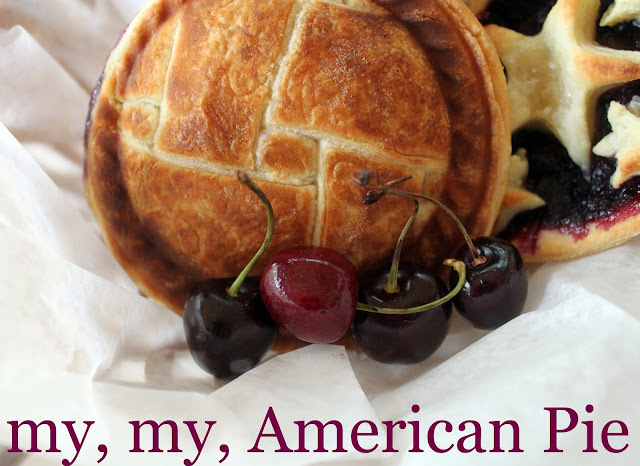 ...so we could have our fresh cherry pies! Deep red cherries with long playful stems dipped in white chocolate. Cherries are one of my all-time favorite fruits and summer loves! When I was a girl, we had a huge cherry tree with branches sagging from treasures of red cherries. We ate them by the bowlfuls on adventurous summertime days. My brother and I also worked our little entrepreneur spirits and we would fill big red coca cola soft drink cups with cherries, line them up in our red wagon and sell our cherry cups door to door. I collected an assortment of fresh berries. 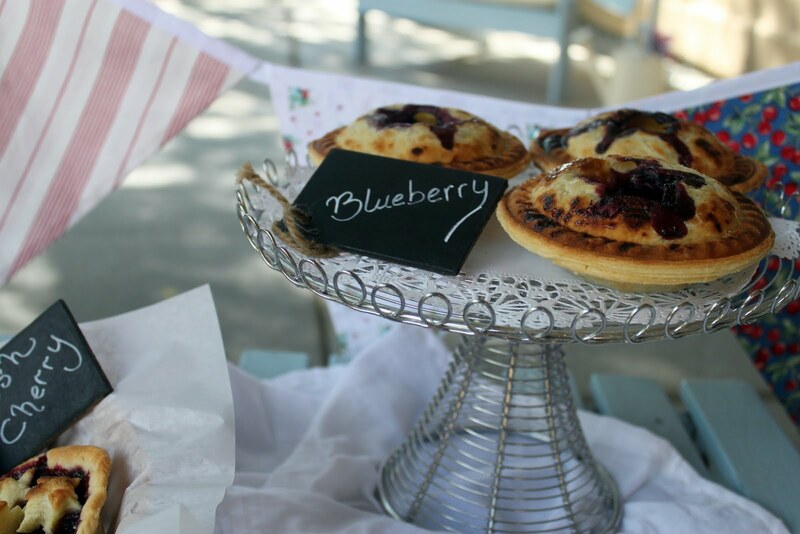 The blueberry was my favorite baby pie! I've been pretty crazy over the mini-sized food serving trends. Baby pies don't disappoint. 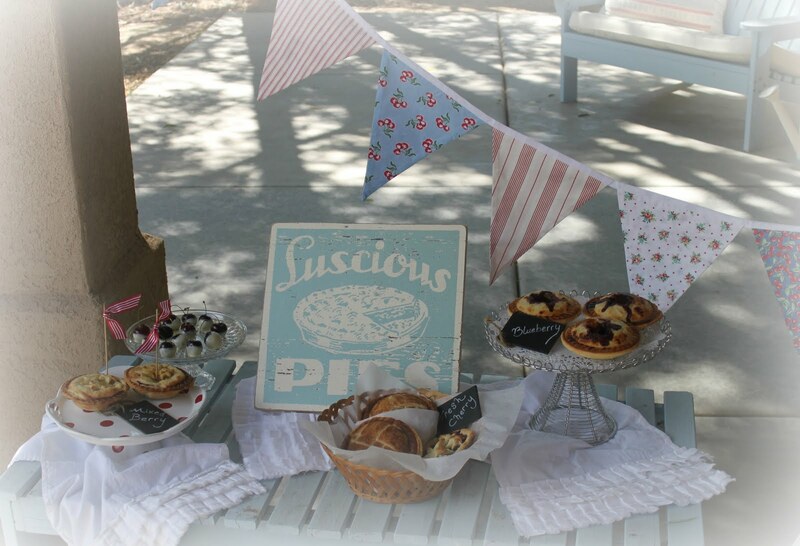 Last year for the 4th, the dessert table was a retro ice cream sundae bar. This year was a backyard pie shop. The boys tell me that last year's was more exciting but I'm all about the pies. When setting up a pretty table that gives the guests CHOICES, I like to showcase each choice differently. Every dessert gets its own individual presentation. Instead of lining up a row of plates, make those desserts shine with something unique for each dessert! 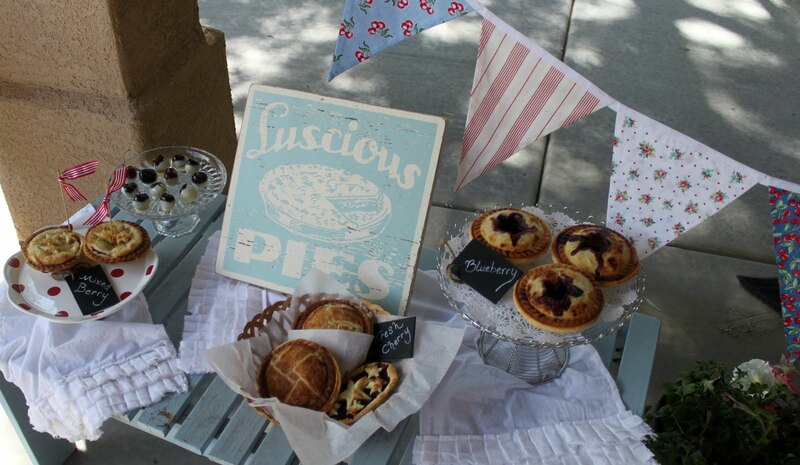 Use baskets, stands, trays, bowls, plates, and boards for dessert presentation. 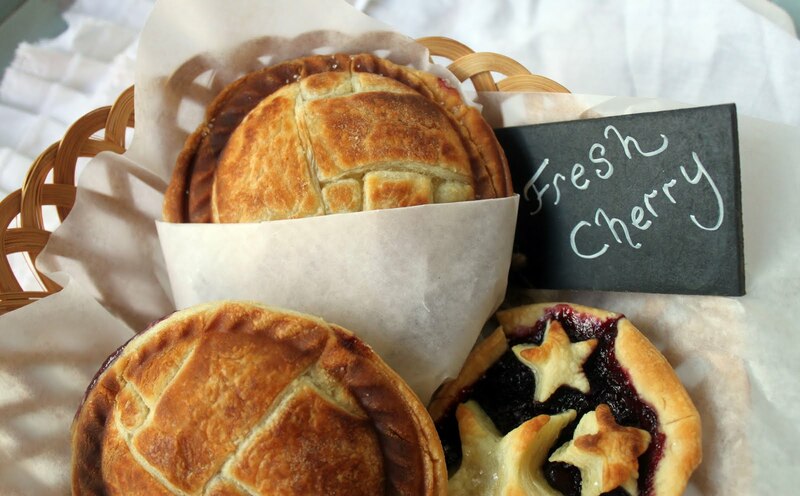 I used chalk tags for labeling the pies. by simply tying ribbon around kebob sticks. 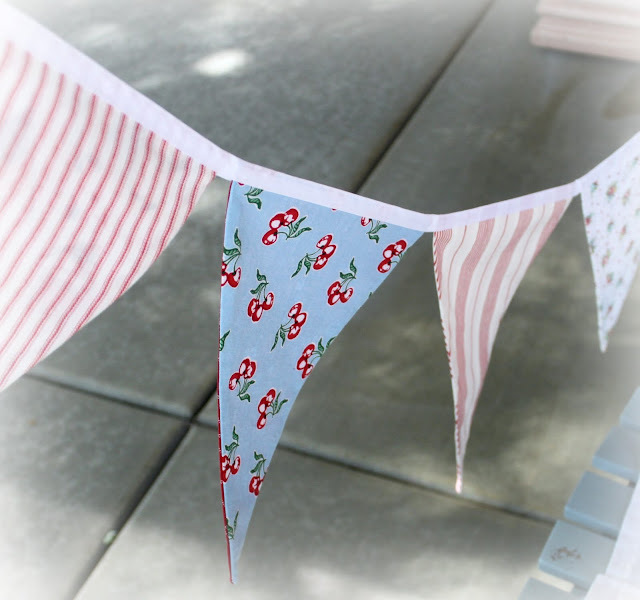 I have this adorable handmade cherry pendant banner that perfectly complimented the setting. 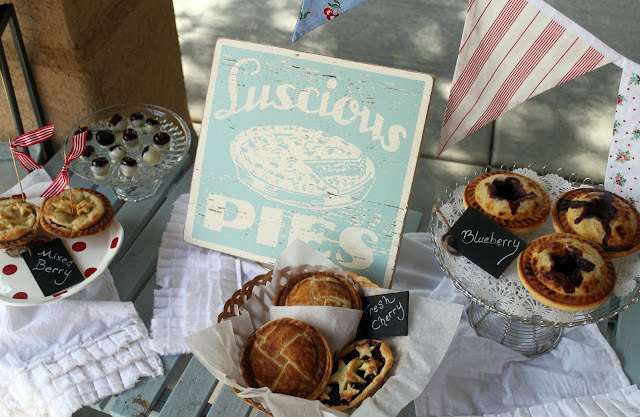 My Luscious Pie sign is from GoJumpInTheLake etsy shop. You will fall.in.love. with every single sign there. Each message is a heartwarming reminder of playful moments in both times in your past and present life. 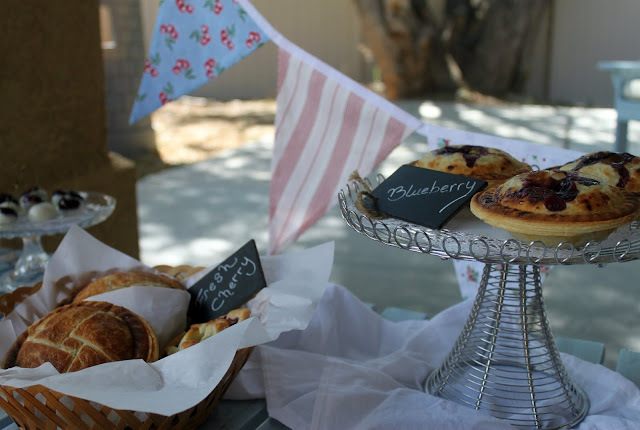 I wrapped some of the pies with paper to grab and go for those who didn't want to mess with a plate and fork. 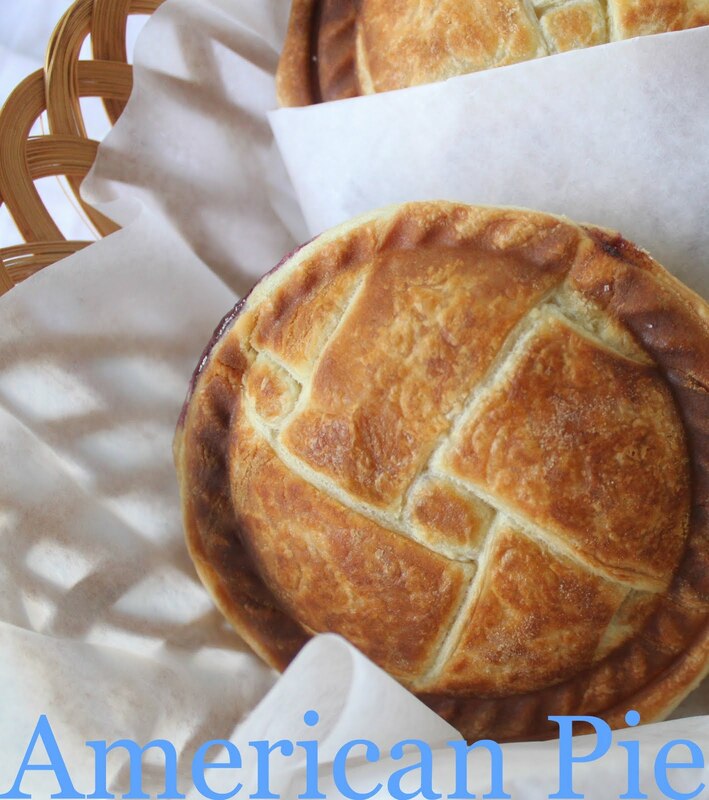 To me, nothing is better than al la mode for my pies! 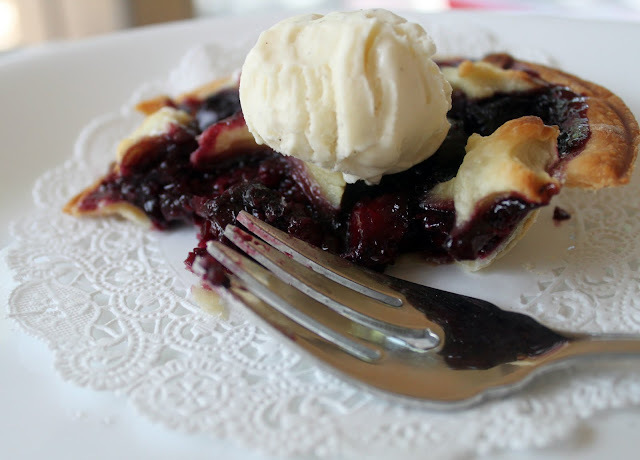 I know you want a slice of pie now. and enjoy your week loves! 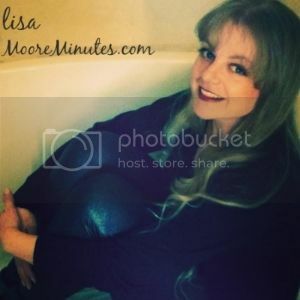 Oh Lisa, everything looks wonderful!! 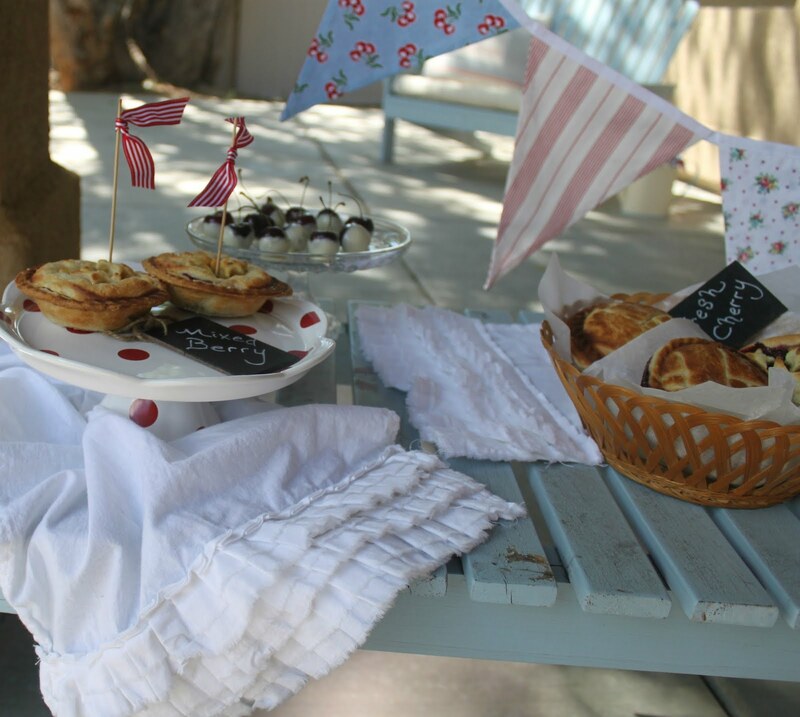 I love the sweet mini pies you've lovingly made and the bunting is so charming! Thank you for sharing your source for your pie sign. I fell in love with it the moment I saw it! Everything looks festive and wonderful!! Nothing says America more than pies! 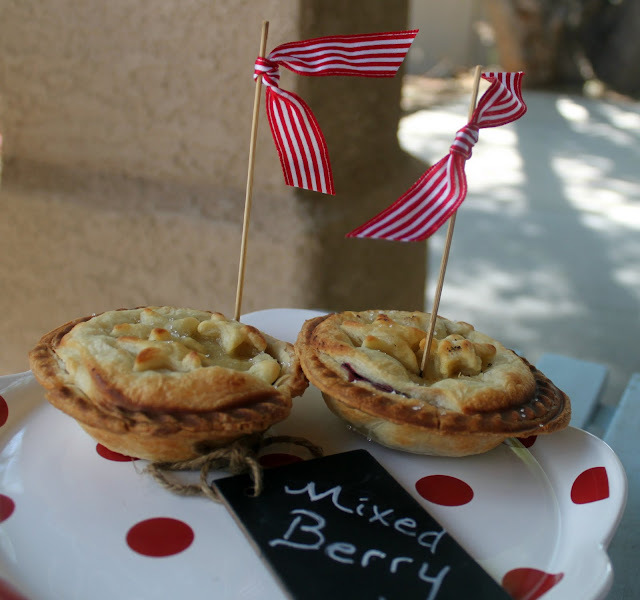 Love the idea of mini assortment pies. Does that mean I can eat more than one? Okay, it's official. Visiting Lisa for an 'event' is going onto my bucket list. Geez, Louise, girl! These look scrumptious! Lisa, these look amazing! My mouth is watering:) Thanks for your sweet comments about my lemonade stand, and stopping by our little ol' blog last week!! Looks like you guys are having a fun summer! My head is spinning - there is so much to comment on. I grew up with 3 cherry trees in the backyard and there are so many memories that those convey. 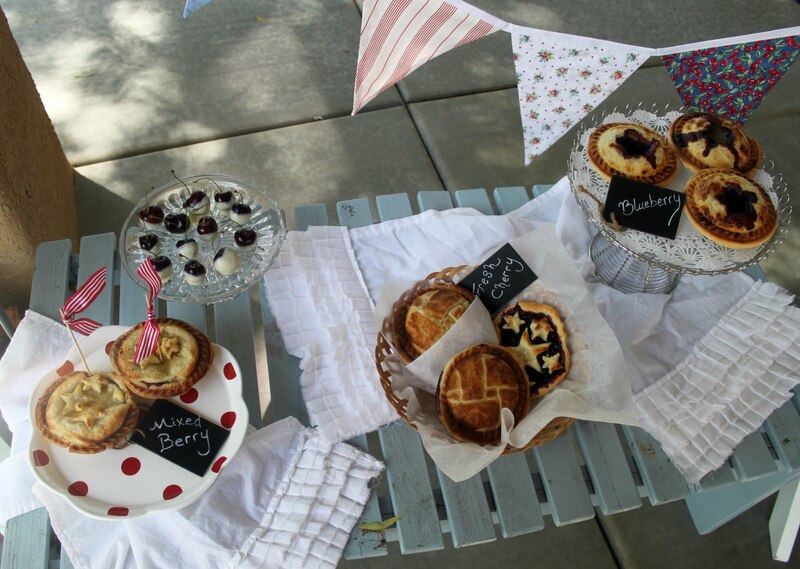 Also, we have a pie party every year and there are so many ideas that I can use for this year! Thanks for sharing, enjoy your week! oh my goodness those look Ah-mazing!! 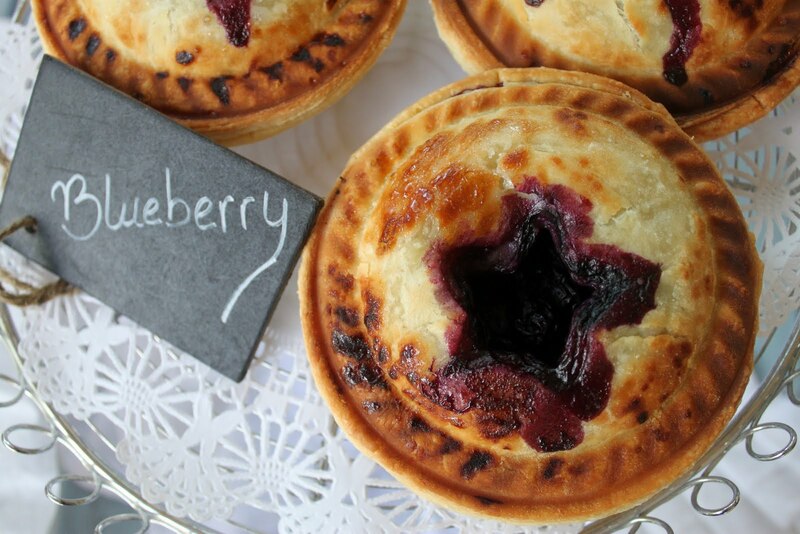 Mini pies are ALWAYS a huge hit! I've been making these since I was a young girl (used to save the store-bought pie tins back in those days!) Now with Williams Sonoma and other stores carrying mini pie making tools, it's so simple to make these darling little hand-held convections that are big on taste and even bigger on impact with guests Ooooing and Ahhhing over them! I'm big on mini everything - especially cute things!! Visiting from the shabby chic cottage linky! 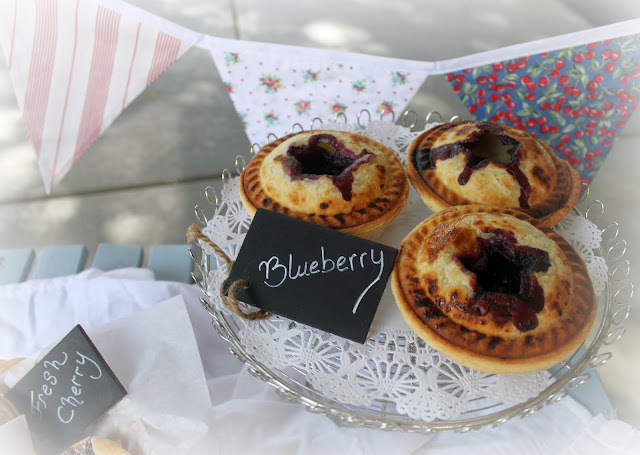 your mini pies are gorgeous, I think I will have to make some for the next party we host! I my goodness...such amazing eye candy! I want one of each and then will come back for seconds! Yummy! Absolutely yummy looking! My husband would be wearing a mustache of blueberry pie! Those are adorable! I've never tried mini ones like this! I love your flag banner, it's so sweet! These look so delicious and festive. 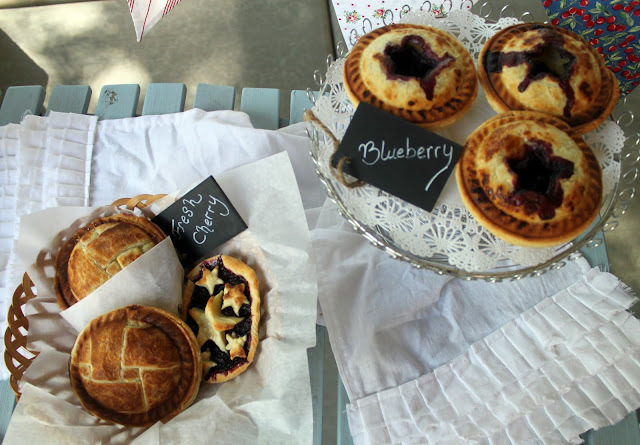 I love to label my foods when entertaining too but you have given me some new ideas! So cute! I love the chalkboards and bunting, and would also love it if you would share this at my linky party this week. 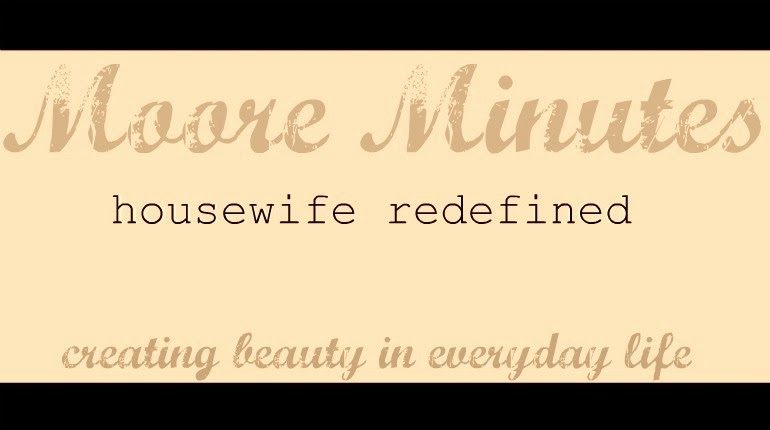 what a fun idea, I love your style and blog! 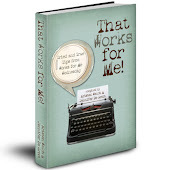 If you have a moment today, please share this with my readers @Creative Juice Thursday. Hope to see you there! I love EVERYTHING about this party - the bunting, the chalkboard tags, everything!! I host a weekly linky party - Saturday Social. I would love it if you would come link up! Beautiful! 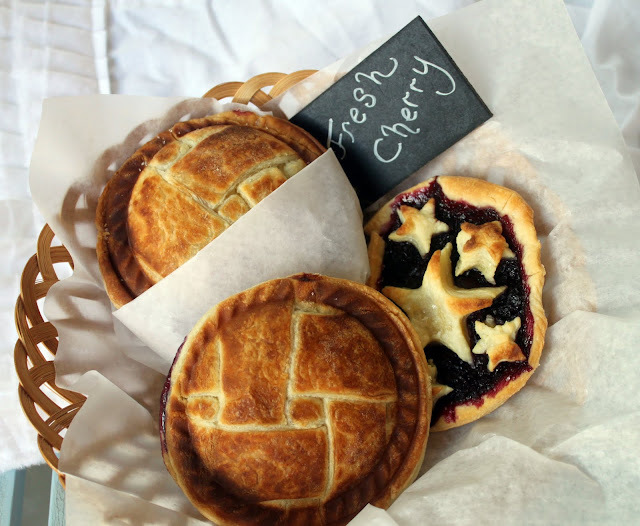 These pies look so delicious. What delicious (and beautiful!) 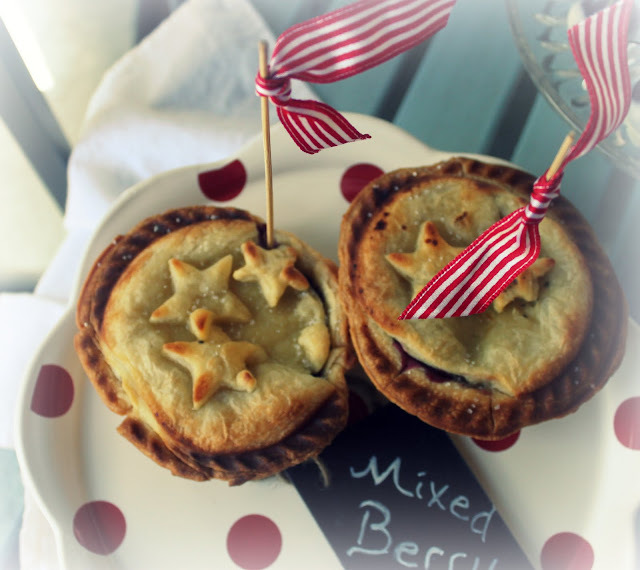 little mini pies! Your vignette is so lovely~ Would love for you to come share this at Feathered Nest Friday at my blog sometime! Oh Lisa! It's almost too beautiful to eat!! Wonderful job!! Love this! There is nothing cuter then minature food. What a pie of a party!! Great idea! 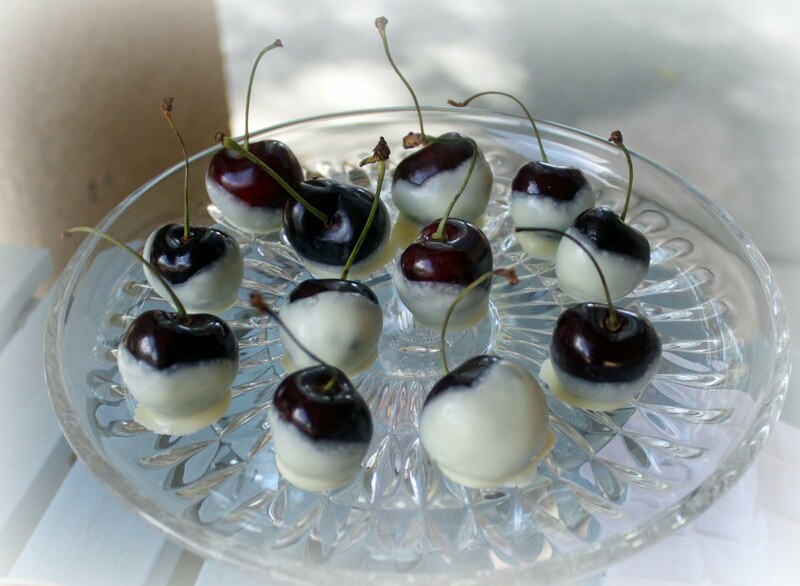 Love the dipped cherries idea too! Greetings. I'm new visiting your site. These mini pies are adorable and they sure look yummy! Congratulations for the presentation of the pies. By the way, what flavor is te one that is doble crusted? Congratulations again and thanks for sharing your ideas. Oh my! They all look wonderful. Love the setting. Would you mind telling me more about the sign? I'm looking for signs for DD2's kitchen. 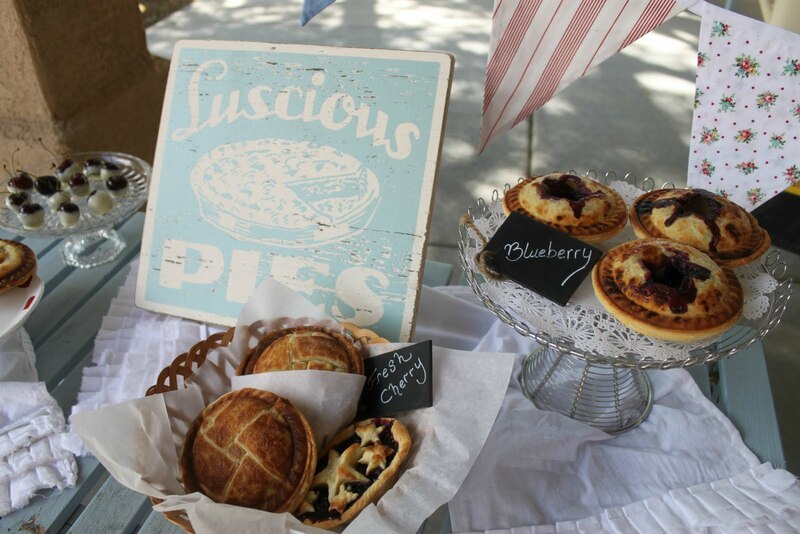 I don't know which to be more excited about - the delicious pies or the gorgeous setting! You are an artist!!! I love the sign Go Jump in the Lake made for you, I'll go check out her shop in a minute. Thank you for sharing the beauty with us ... did I mention I love the stars cut in the pastry?!?! Everything looks so yummy! 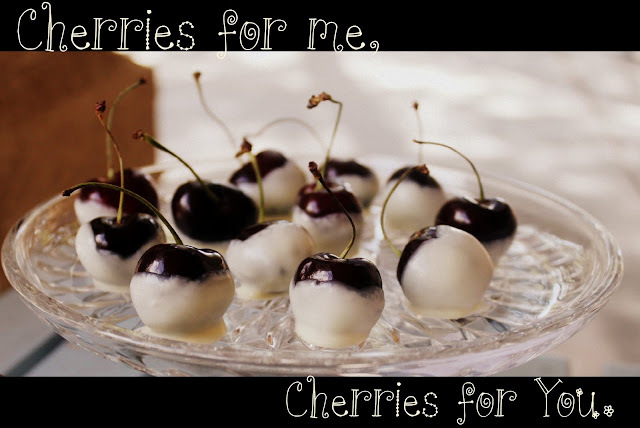 Especially those cherries! Oh my goodness! You had me at Pie's! How gorgeous! 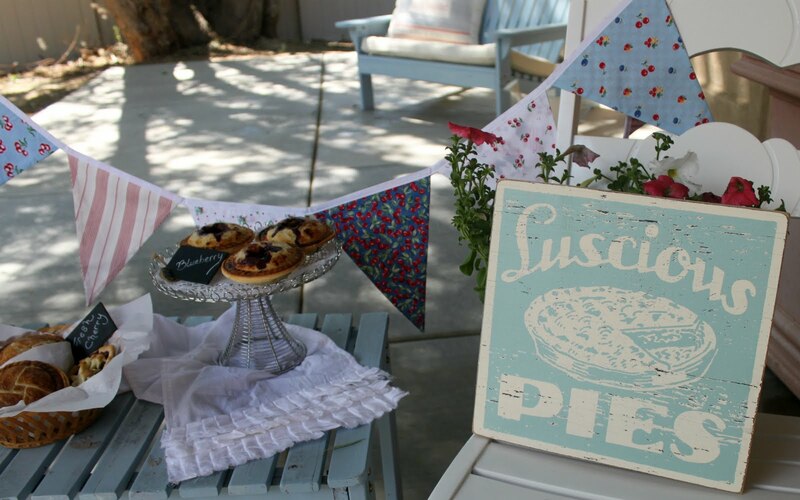 That bunting is totally adorable, but it was hard to take my eyes off that mouthwatering pie. And this is coming from someone who is a chocolate cake person, so that is a great compliment to your pie making abilities. I bet they taste as good as they look! I came across your blog on Balancing Beauty & Bedlam...I love it...I'm a new follower! Very cute ideas! I love so many things about this party...the cute fabric banner, the table-scape is so pretty...I especially love the chalk board tags! Wow, the pies & the photos are so impressive. I just want to walk right into one of these pictures & be there! Absolutely adorable! I love the whole look of your pie display. Thanks for a great post. I found you on Tempt my tummy Tuesday.